What does good health and wellbeing mean to you? 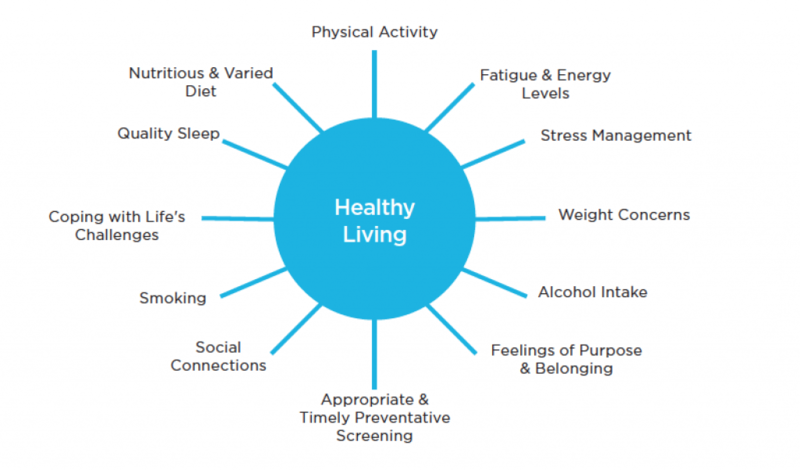 Our health impacts on our lives. Good health helps us get to where we want to be in life. A sense of wellbeing makes us feel content with our current state of being and confident that we can move forward and achieve the things we want to do with our lives. What factors that impact your health and wellbeing, would you like to work on? Studies show that the more variety in your diet the more likely you are to meet your nutritional requirements. The Australian Guide to Healthy Eating can support you to eat a variety of foods essential to health and wellbeing. Moving your body keeps you well. Choosing an activity you enjoy, increases the likelihood you will continue doing it. A variety of movement based activities can improve your strength, balance and flexibility as well as aerobic (heart and lungs) fitness. Diet-cycling and unintentional weight gains or losses can have adverse effects on your health. Speak to your health coach or health care professional if you have weight concerns. Your health coach or health care professional can support you to foster an awareness of your fullness levels and identify non-hungry eating. Good mental health and wellbeing gives us the ability to function well, have meaningful social connections, positive self esteem and the ability to cope with changes in life circumstances. Speak to your health coach or health care professional if you have any concerns regarding your mental health and wellbeing.